Fancy raising some money? 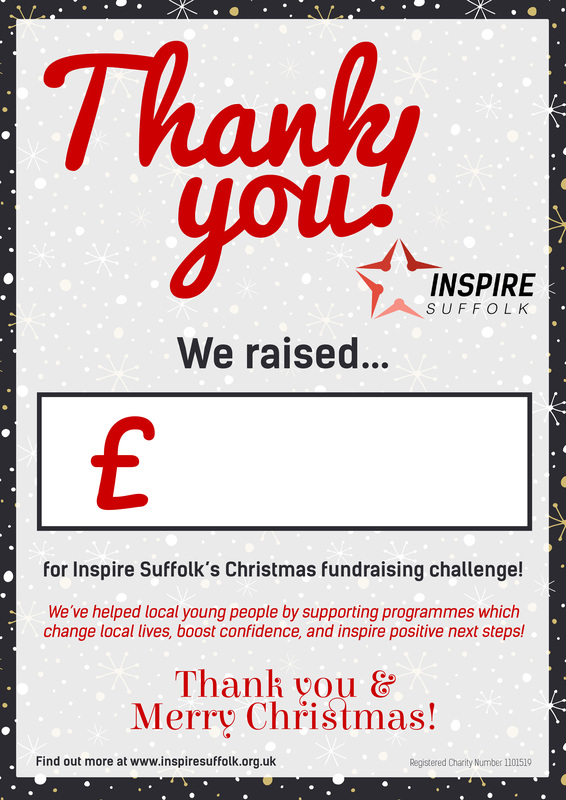 Here are some fund-raising ideas from Inspire Suffolk! The festive period is well and truly upon us! 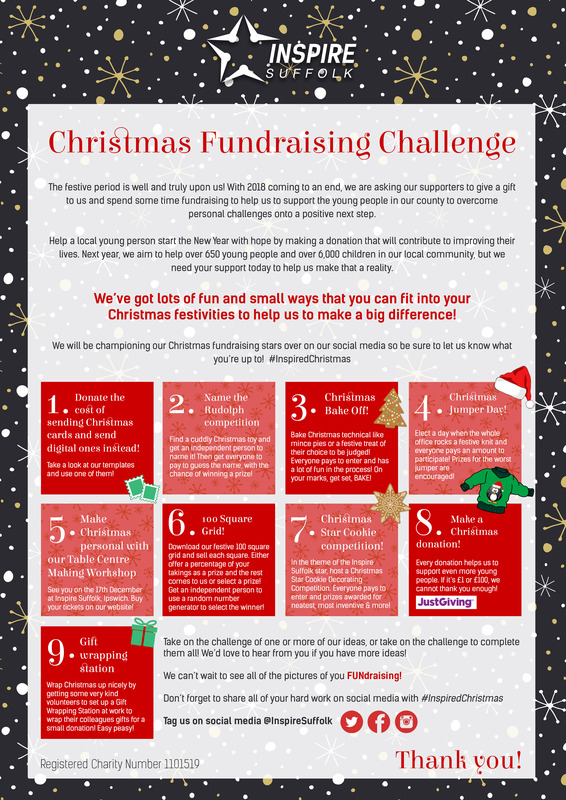 With 2018 coming to an end, we are asking our supporters to give a gift to us and spend some time fundraising to help us to support the young people in our county to overcome personal challenges onto a positive next step. Help a local young person start the New Year with hope by making a donation that will contribute to improving their lives. Next year, we aim to help over 650 young people and over 6,000 children in our local community, but we need your support today to help us make that a reality. We’ve got lots of fun and small ways that you can fit into your Christmas festivities in the office, store or elsewhere to help us to make a big difference! Put the poster up in your office! 1. 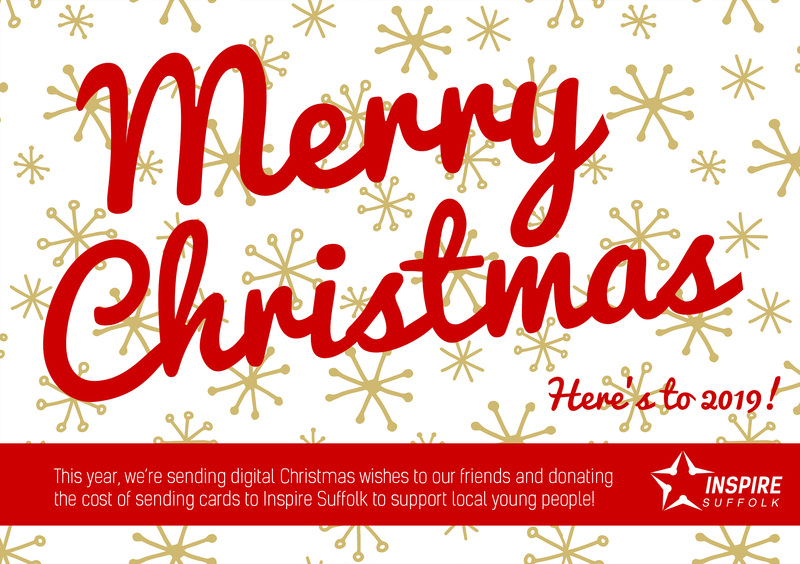 Donate the cost of sending Christmas cards and send digital ones instead! Take a look at our templates and use one of them! Find a cuddly toy and get an independent person to name it. Then get everyone to pay to guess the name, with the chance of winning a prize! Bake Christmas technical like mince pies or a festive treat of their choice to be judged! Everyone pays to enter and has a lot of fun in the process! On your marks, get set, BAKE! Elect a day when the whole office rocks a festive knit and everyone pays an amount to participate! Prizes for the worst jumper are encouraged! See you on the 17th December at Inspire Suffolk, Ipswich. Buy your tickets on our website! Download our festive 100 square grid and sell each square. Either offer a percentage of your takings as a prize and the rest comes to us or select a prize! Get an independent person to use a random number generator to select the winner! 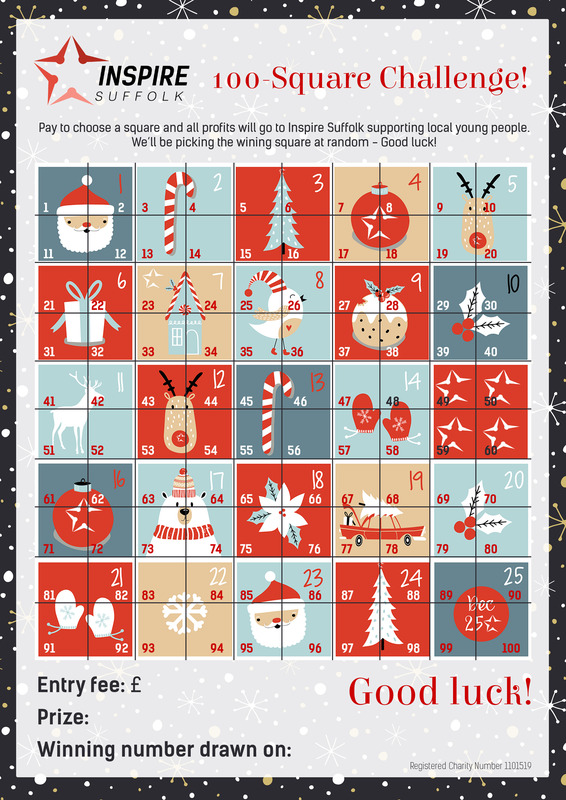 In the theme of the Inspire Suffolk star, host a Christmas Star Cookie Decorating Competition. Everyone pays to enter and prizes awarded for neatest, most inventive & more! Every donation helps us to support even more young people. If it’s £1 or £100, we cannot thank you enough! Wrap Christmas up nicely by getting some very kind volunteers to set up a Gift Wrapping Station at work to wrap their colleagues gifts for a small donation! Easy peasy! 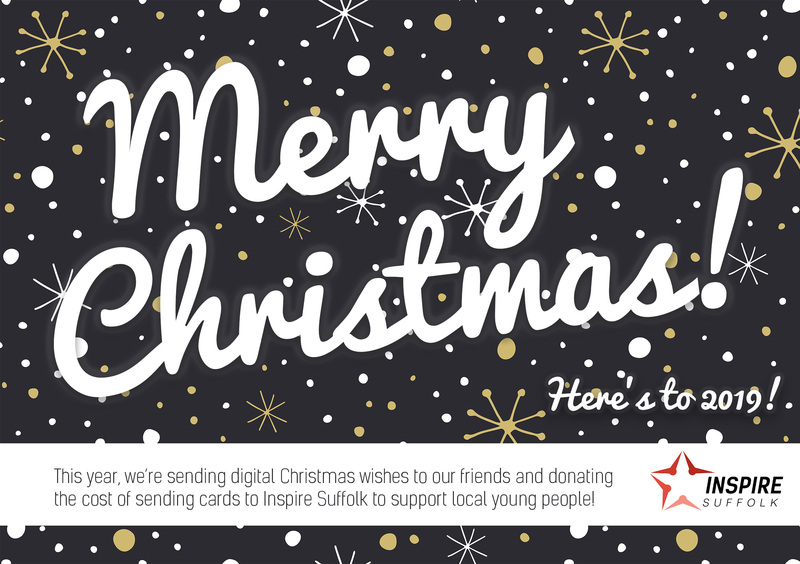 We hope you’re inspired to get festive for Inspire Suffolk! 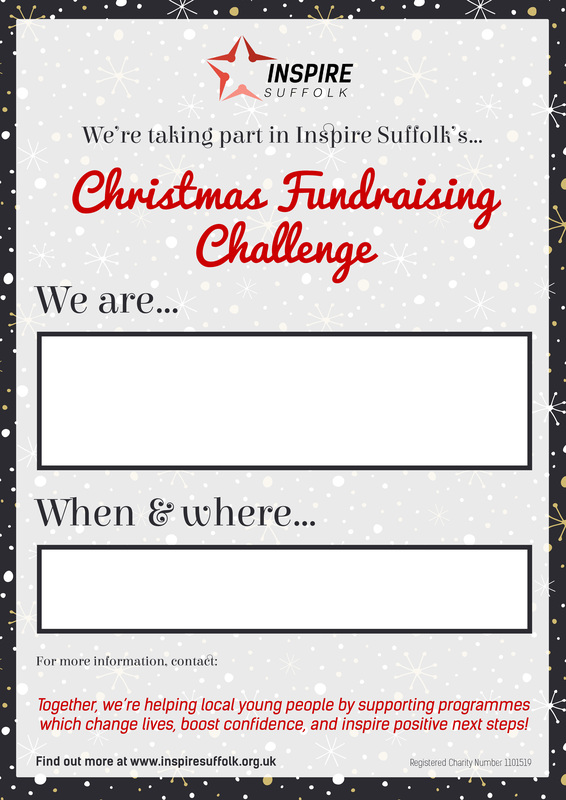 If you have any questions or want to let us know your plans, get in touch with our Fundraising & Events Officer, Sara Warburton, on saraw@inspiresuffolk.org.uk or call 01473 353 194. Arthur Ransome's Selina King build photography in Pin Mill.